* flash content can be extremely engaging. * flash apps are a great way to create something viral. * flash is currently used extensively on the web for everything from video to games to product demos. * Creative Directors love flash. * Brand Managers also love flash. I apologize if you were feeling pretty good about flash until the last bullet! ;-) That is the reality, though. Why Has Flash Been Confusing And Hard To Track? Let’s take a quick look at why flash tracking has been an issue. First and most basic, there are many people that don’t know you can even track flash applications. That’s a tough obstacle to overcome, right? Second, the Analytics team is sometimes not involved during the planning of flash-based projects or campaigns. I’m sure some web analysts reading this post probably believe that’s an understatement! Third, you need to coordinate mechanisms for tracking flash with both flash developers and analysts. Fourth, there has been confusion about how to actually track flash even if you already have your flash developers and analysts in the same room. Last (at least for this initial list), some people will focus on the end result (conversions only) and not track the specific elements on the website that lead to the conversion. i.e. As long as people buy something or sign up, I don’t care what they do on the site. As you can probably guess, I’m not a big fan of the latter… I think the more information you can gather about how visitors interact with your website, the more you can optimize the website to increase conversion (whatever conversion is for your specific business). OK, But What Is It Exactly? There are two components you can use in flash that enable you to track events, pageviews, conversions, etc. One is a simple flash component that you can customize in the component inspector in flash and the other component involves importing the tracking libraries into your project and then making calls to GA from within your ActionScript code (AS3). I’m going to cover the second approach, since it gives you the most flexibility. And don’t get scared with the way it was explained above. It’s actually straight forward if you are comfortable working in flash. I’m going to walk you through my example step by step in Part 2 of my series on tracking flash in google analytics. If you have worked in flash and written some ActionScript code, I’m confident you will be able to follow along. If not, grab your flash developer and your web analyst and then schedule a working lunch. You can all walk through my example together as a team. After going through my second post, I have a feeling you will collectively brainstorm several ways to use the GA for flash component to track your flash elements, websites, and applications. So Are You Excited To Start? 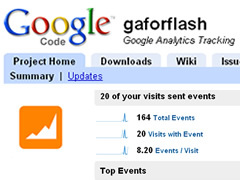 Good, then you’re ready to read my second post, which covers how to track flash in Google Analytics using the GA for flash Tracking Component.